This true story about four Navy SEALs who embarked on an ill-fated covert mission to take down a high-level Taliban leader in Afghanistan is absolutely incredible. It's not political, it's not pro-war, but rather pro soldier. It's about strength, courage and survival, not to mention it show-cases the great capacity of human endurance, of desperation, of resolve, and resignation. From the film's title, it's no surprise only one SEAL survives - Marcus Luttrell (Mark Wahlberg) was the only one to make it out alive. With the help of a near by village leader, he finds protection from the Taliban. It's incredibly moving how these villagers put their life on the line to help a complete stranger too. Basically, an enemy of my enemy is my friend. 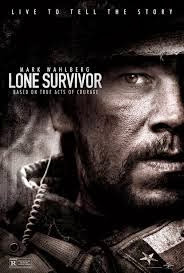 Lone Survivor seriously impressed me. Needless to say it's remarkable what these men and women go through to protect our country. If you like war movies go see this movie or read the book of the same title. You will not be disappointed. Just be prepared to tear up a little in the end. So I guess the title kind of gives it away, right?